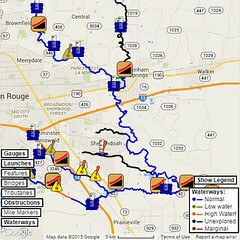 Our third-annual PaddleBR Paddle-In Movie is coming up soon. Tickets will be available to anyone starting on September 28th, but we wanted to give our supporting members special access to grab your tickets early. Sign up now to get your tickets (and reserve boats if you need them), and then on September 28th, start passing the word so we can “sell” out our full screening license count. 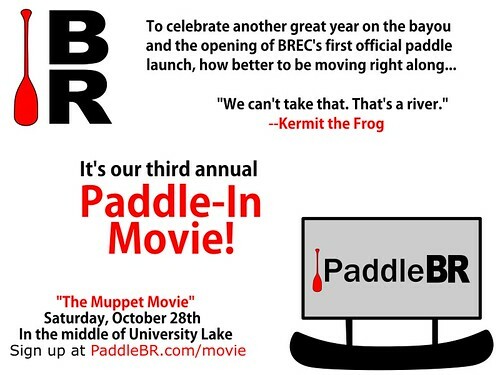 We love having our Paddle-In Movies to say thanks to our PaddleBR members, whose support makes much of what we do possible, and this year we’re extra happy to be able to celebrate the opening this year of BREC’s first official paddle launch on the Bayou Fountain paddle trail at Highland Road Park. Everyone is welcome, supporting member or “just” another paddler, we’d love to have you out there. There is no charge or admission fee, but since space is limited and we have to pay the license fee based on attendance, please get your tickets in advance. If you don’t have a canoe, kayak, or paddleboard of your own, you’re in luck! We have put together a fleet of 15 canoes and almost as many kayaks just waiting to be reserved for your movie watching enjoyment, also completely free (but tickets required). Your tickets will be delivered by email, with details about the event and contact information if you need to change anything.